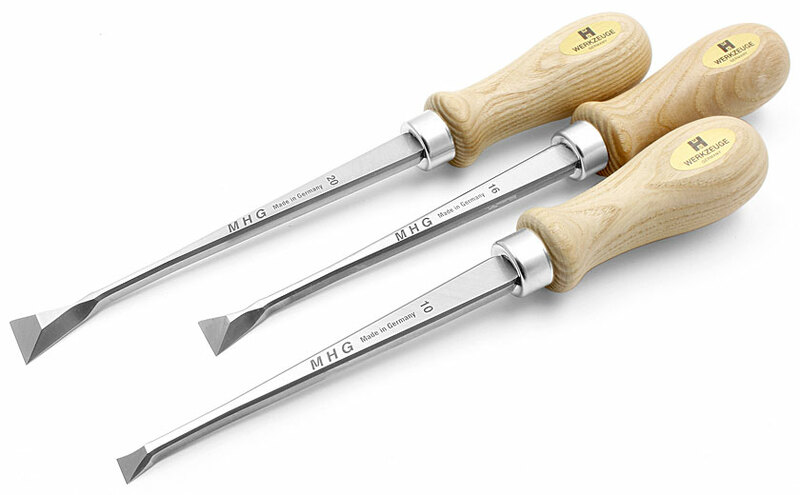 Normal paring chisels have the same width over the entire blade length and are used for delicate touch-ups of tenons, shoulders or scarphs, in short, for nearly all wood joints. Hammers are not needed as a rule; the blade is either pushed by hand or the chisel is tapped lightly with the ball of the thumb. This is not a chisel for vigorous material removal but rather for delicate retouching of essentially finished wood joints in an endeavour to improve the fit. 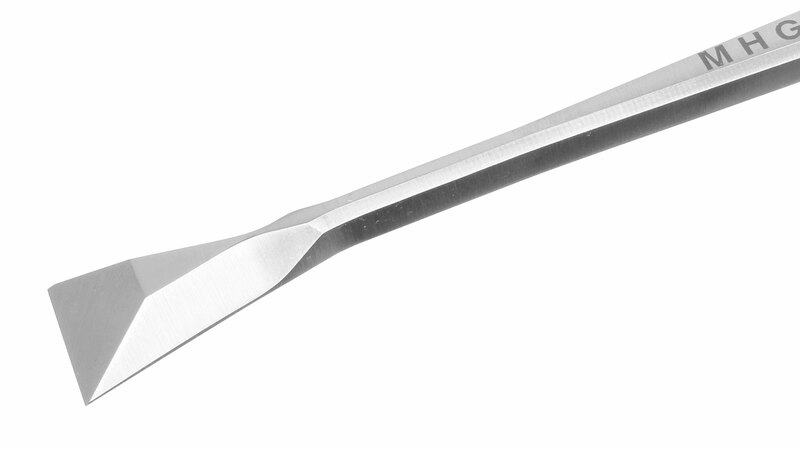 On the fishtail version of paring chisels the blade width tapers rapidly over a length of 20 - 30 mm to a width of about 5 mm. From this point onwards the blade widens again so that it is about 15 mm at the ferrule. This is ideal for reaching undercuts such as swallow tail joints. The face of the blade is ground flat from blade tip to handle which allows for highly accurate manipulation on flat planes. 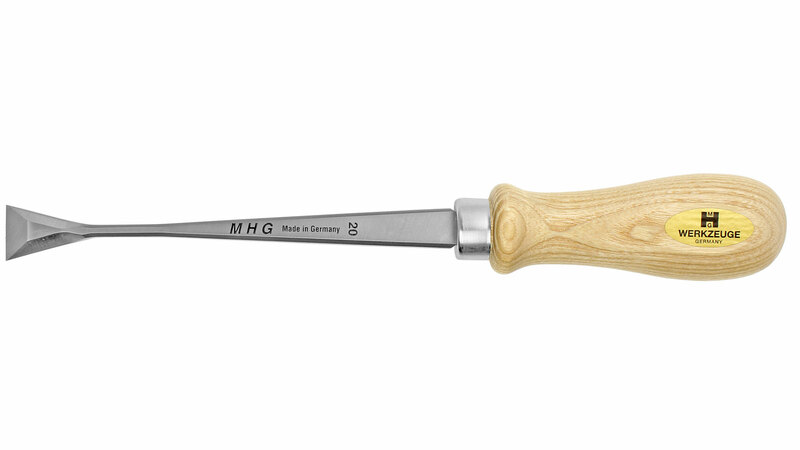 MHG Fishtail Paring Chisels These new paring chisels from MHG come with an oiled ash handle that has two flats on opposite sides to prevent the tool from rolling away. Note: Be careful when you remove the protective caps that are fitted to these chisels! Because of the greater width of the cutting edge you run the risk of cutting into your fingers when removing the caps! Hold the caps by the top and bottom, not by the sides when you remove them. These blades are produced by a new forging process, resulting in tools with high edge retention, elasticity and a long service life. The high degree of microstructure compaction and the quality heat treatment of the high-alloy steel results in performance characteristics that previously could only be found in hand-forged tools. The hardness over the whole working length is 61 HRC (± 1). Individual tool lengths can deviate by several millimetres. 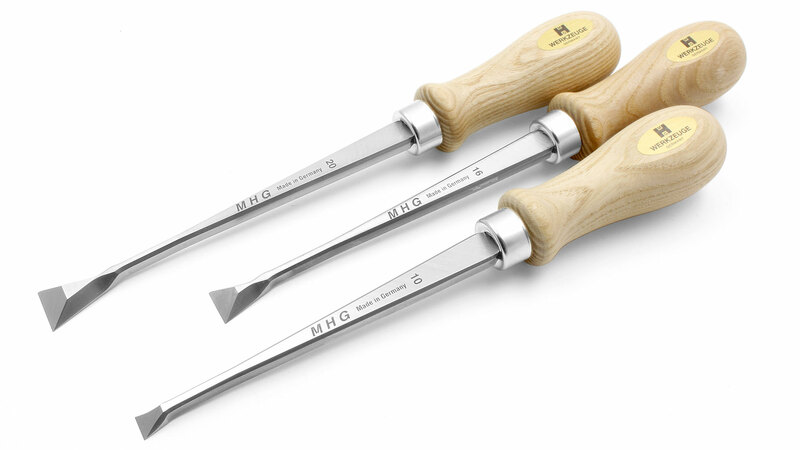 3-part Set Fishtail Paring Chisels from MHG Set comprises all 3 sizes 10 - 16 - 20 mm. No special packaging!